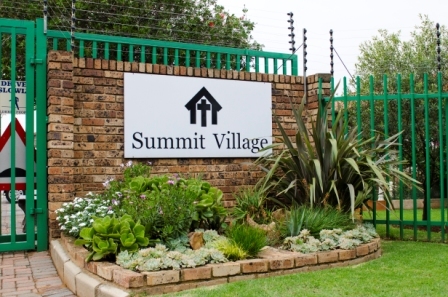 SUMMIT VILLAGE, situated in the heart of Roodepoort's West Rand suburb of Ontdekkers Park, is a delightful haven for seniors, in close proximity to excellent clinics, hospitals, service centres, churches, Westgate Shopping Centre and other smaller shopping centres, sports complexes and bus routes. The layout of SUMMIT VILLAGE is in keeping with its natural unspoiled surroundings. Its beautiful landscaped gardens create an atmosphere of peace and tranquillity and residents are encouraged to express their own gardening talents should they so wish. The village consists of 119 modern, north facing, self contained facebrick units of various sizes, some with attached garages with remote control tip doors, or carports. Each cottage has a lounge, kitchen, bathroom with bath or shower, plus either one or two bedrooms, and some have an additional study. Bedsitters are also available. SUMMIT VILLAGE does not have its own frail care unit but this facility is available at other Methodist Homes for the Aged.